I haven't done any crafting lately, as I just haven't been feeling up to it. Trying not too move to much, as I don't want to rip open any incisions. I have to say that I have the greatest hubby in the world. He is taking very very good care of me. The intentions of this card was not to make it monochromatic, but that's how it worked out. I think it looks so cute! I cut out a circle with my nesties, and then sponged it with Momento Angel Pink ink. 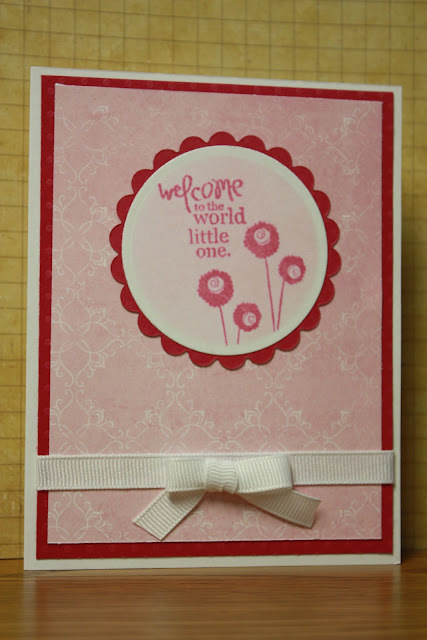 The stamps are from Michael's Studio G line and I added some white gingham ribbon and a bow for some texture.